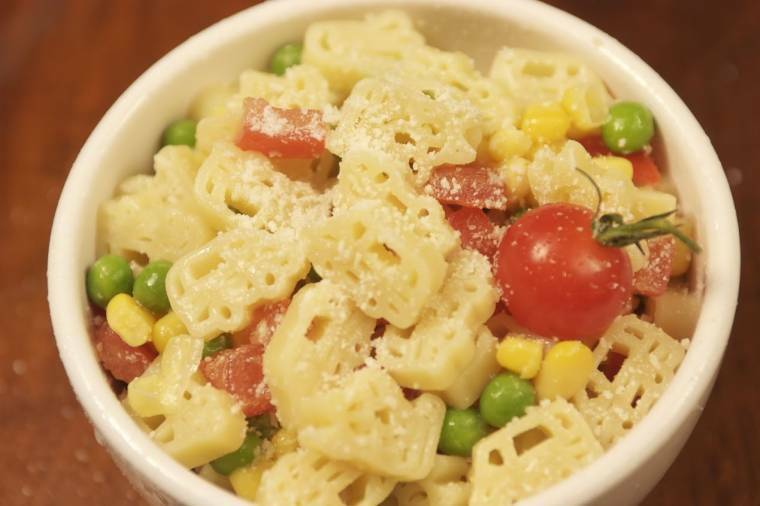 Stars and crescent moons make up the shapes of this gorgeously pretty variety of pasta for children. So I am inspired to create something that reminds me of shooting stars and happy dreams. Dress the pasta with as much of the sauce as you like, as some children like lots of sauce and others only want it barely coated, and refrigerate or freeze the rest for later use. To turn it into something slightly more sophisticated, substitute the ham for chopped chorizo or salame, and add some finely snipped fresh chives. Bring a pot of lightly salted water to a rolling boil for the pasta. Meanwhile, fry the spring onion very gently in the olive oil until soft but not coloured. Add the passata and stir together. Allow to simmer for about 10 minutes, and then stir in the mascarpone or cream, the ham and the sweet corn cobs. You should end up with a sauce that is swirly and dreamily pink, with the long comet tails of the sweet corn through it. Cook the pasta until tender in the boiling water, drain and toss with the sauce. Pile the pasta into bowls or on to plates, garnish with the Parmesan shavings and serve at once. P.S. For special occasions, finish off the dish with a tiny dusting of edible gold glitter, a little stardust sometimes works wonders on even the fussiest of diners! 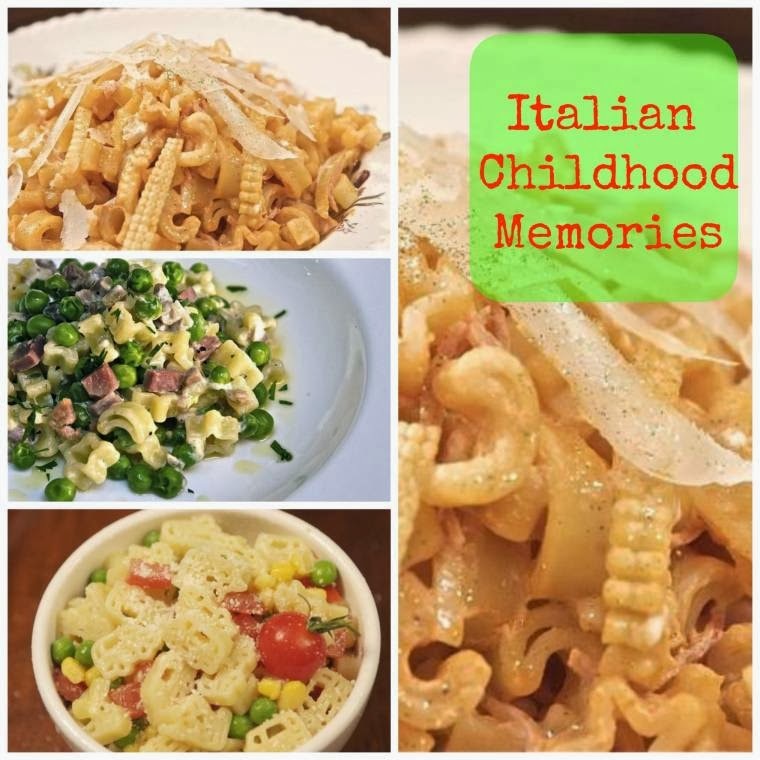 This is a very simple and easy dish that I remember very fondly from my childhoood in Tuscany. I really prefer to use Penne when I make this as it fits the memory much better, but I’ve tried it out with the Motori shape from the Garofolo range and it really works too. You can of course add other things to the dish such as grilled bacon, cooked peas, mushrooms or cauliflower florets, or blue cheese for a much stronger flavour. You can easily make this ahead and freeze it for later. Meanwhile, heat through the sauce and melt three quarters of the cheese into it. Drain the pasta and pour it back into the pot. Add three quarters of the sauce and the ham. Grease a large oven-proof dish with half the butter. 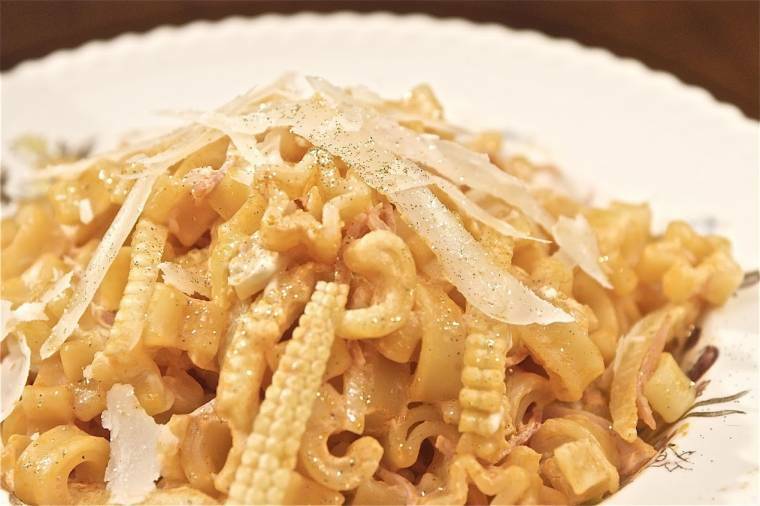 Pour in the dressed pasta and arrange it carefully. Pour over the remaining sauce and dot with the remaining butter. Bake in a preheated oven at Gas mark 6/400 F/200 for about 15 minutes or until golden and bubbling. Remove from the oven, rest for 5 minutes, then serve. 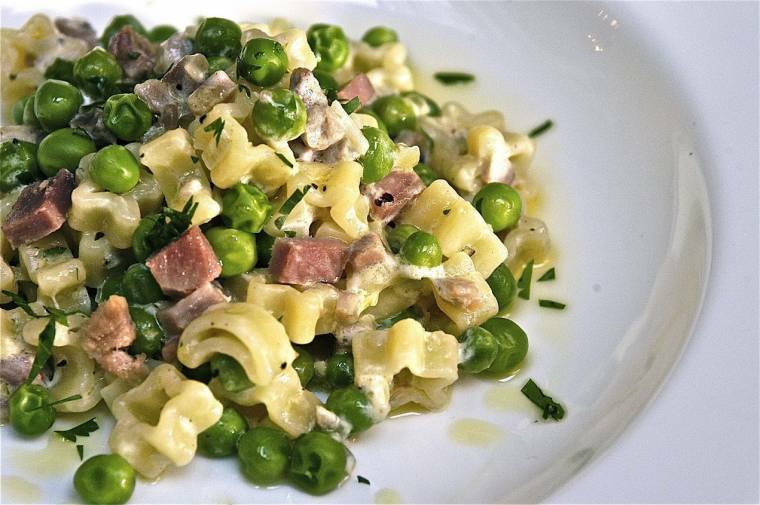 This is an all-time favourite in Italy, and the pairing of ham and cream with the addition of very sweet soft peas make this recipe a totally irresistible even the fussiest of child. 100 g ½ cm thick cooked ham (York ham is fine or any good quality ham) cut in very small cubes or finely chopped. n the meantime in a small pan cook the fresh or frozen peas, drain and set aside. Add the finely chopped ham and cook gently a couple of minutes. At this stage add the peas, and season to taste but be aware the ham is already salted and parmesan will be added eventually. When all ingredients are well incorporated, add the cream and warm trough. In the meantime boil a copious amount of water (at least one litre per 100 g of pasta), and when boiling add the salt, roughly speaking 2 Tsp rock salt, add the pasta. Drain well the pasta and add it to the sauce, mix well and sprinkle with the chopped parsley and the parmesan. (‘La Giostra dei Bambini’ – ‘the children’s merry-go-round’) – Pasta Garofalo. The Full Monty : Wednesday Blog Hop..
"Abbey Road ? : Wordless Wednesday Linky…"
"Podium Power Porridge, Superfast Superfood Salad, An Isotonic Sports Smoothie And Raspberry Recovery Bars"
These look SO delicious! You are from Tuscany? My family is all from Abruzzi. I can't wait to try these with my family! 🙂 Feel free to come over and link it up with my "Try a New Recipe Tuesday." It's open all week. I'd love to have you join us. 🙂 Ciao! These dishes look oh so yummy Clairejustine! Just looking at them makes me hungry! Have a good Thursday.